Water reactive substances are dangerous when wet because they undergo a chemical reaction with water. This reaction may release a gas that is either flammable or presents a toxic health hazard. In addition, the heat generated when water contacts such materials is often enough for the item to spontaneously combust or explode. In simpler terms, water reactive materials are incompatible with water. Get your water-reactive signs and labels at Safety Emporium. 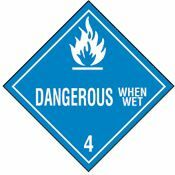 Dangerous when wet materials are classified as R2 under the UN classification system and as Hazard Class 4.3 by DOT under 49 CFR. Special precautions, labeling and training are therefore required when transporting, storing and using such materials. The heat generated by this reaction is sufficient in most cases to ignite the hydrogen gas (H2) that is evolved in the reaction. This can result in a powerful explosion depending on the amount and surface area of the alkali metal. Elemental potassium and cesium are particularly dangerous in this regard; even one gram can cause a serious hazard. Thus, it is critical that water reactive substances be stored in dry areas and kept off the floor by the use of pallets or rack storage. Dangerous when wet materials should never be stored directly beneath active water sprinklers and should be isolated by a waterproof or water-resistant barrier (e.g., plastic sheeting or a water-tight secondary container) to protect the materials from water in the event the sprinkler system is activated elsewhere in the facility. Likewise, these materials should be stored in the original shipping container or in a compatible container of equal or greater strength. Prior to storing reactive materials, all combustible rubbish, dry or oiled paper wrapping material, and other combustible materials should be removed from the storage area. The area should be conspicuously marked or posted to indicate the material being stored. Access to the reactive materials storage area should be restricted. Personnel should not be permitted to enter the area unless accompanied by an individual familiar with the hazards of the material stored in the area. There are additional classes of reactive compounds under the UN and DOT classification schemes, such as pyrophoric substances. Therefore, further segregate such materials within your Reactive Storage area. Finally, make sure that an appropriate Class D fire extinguisher is available in the event of an emergency and that personnel have been trained in the proper way to deal with fires involving water reactive materials. Water should not be used to fight fires that involve water-reactive materials. In addition, many water-reactive chemicals are also reactive with carbon dioxide, another common fire-fighting agent. Get your Class D extinguishers at Safety Emporium. Water-reactive materials pose serious risks. The MSDS will provide information about these risks as well as the precautions you should take in handling the material. Pay particular attention to the fire fighting media and procedures listed in the MSDS. Make sure that your water-reactive materials are well-marked so that fire fighters and other personnel are aware of the danger in an emergency situation and be sure to have a proper Class D fire extinguisher on hand. MIT has a great writeup on Pyrophoric and Water-Reactive Chemical Safety. The US DOT's Pipeline and Hazardous Materials Safety Administration has a Table of Water-Reactive materials Which Produce Toxic Gases (32 Kb PDF file). Lawrence Berkeley National Lab has a good primer on Control Procedures for Reactive Chemicals that covers peroxides and water reactive chemicals. NOAA has an interactive chemical response tool titled Could it react with water?. See also: Anhydrous, flammable solid, hyroscopic, pyrophoric. Further definitions from Google and OneLook. Entry last updated: Wednesday, September 12, 2018. This page is copyright 2000-2019 by ILPI. Unauthorized duplication or posting on other web sites is expressly prohibited. Send suggestions, comments, and new entry desires (include the URL if applicable) to us by email.